The County Council have submitted a bid for over £500m of up-front transport improvements to the Transport Innovation Fund. This is a pot of money from the government to entice local authorities into trying out congestion charging schemes. This means a massive range of transport improvements: better cycling provision, more buses, a new train station, and much more. The congestion charge itself would be a one-off charge for anyone driving into, out of, or within the congestion charge zone (basically all of Cambridge), between 7.30 and 9.30am, weekdays only. The proposed charge is currently projected to be in the range of £3-5 per day, depending on payment method, for any number of passings in/out of the zone during the time of operation. Camera sites: There would be 37 camera sites and 5 mobile sites. See the map of the camera points. All the Park & Ride sites would be outside the zone. This amount of up-front funding would amount to roughly ten times the amount of current money the County Council receives each year for general transport improvements. 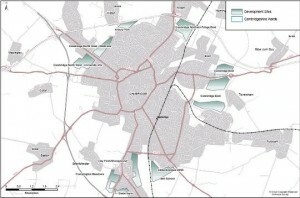 Between 1999 and 2016 at least 57,400 new households are planned for the county; approximately 33,000 of these homes are still to be built, mainly in the Cambridge area. To put this figure in context, the 2001 census gives Cambridge’s population at almost 109,000 (including students) people; including areas of South Cambs that are considered to be ‘in the city’ this figure can be estimated at about 130,000 people. The British Chambers of Commerce estimates that congestion currently costs the UK economy approximately £17 billion per annum [reference]. In addition, 1.2 billion hours are lost to congestion every year. If the bid is successful, implementation of the proposed transport improvements could commence from 2008 onwards, though this timescale is now thought to have been moved back at least 6 months or so. Congestion charging would be a further three years away (at least). TIF (the Transport Innovation Fund) [see also government statement to the House of Commons] is a government pot of money with £1.3bn available. At present, it looks as if only Manchester and Cambridge would be amongst the bidders, giving them a high chance of receiving this money. It is important to note that a decision to introduce congestion charging has not yet been made, despite the County having submitted a business case in autumn 2007. Submitting a business case to government does not commit the Council to introducing it.